Darren and Leja from Phibonacci Custom Dental contacted us the beginning of last week needing help with getting a website created. Darren created all of the graphics for the website but needed someone to put it together and in a website that was functional. After gathering all of the details that he wanted, we got to work right away on the site and had it completed within 48 hours of the material being received. We appreciate the business from Darren and Leja and hope we can help with any other future website needs! 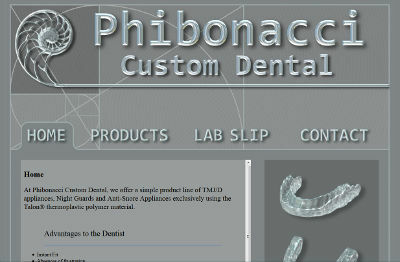 The Phibonacci Custom Dental website is at phibonaccicustomdental.com.